Textured Enviro Liner® 6000x is available with superior friction properties. Textured Enviro Liner® 6000x geomembranes are available with texturing on one or both sides to provide excellent interface friction properties in combination with outstanding longevity. Layfield's Enviro Liner® 6000x formulation is stabilized with a proprietary blend of UV stabilizers and antioxidants making it one of the most durable geomembranes on the market. Enviro Liner® 6000x textured geomembranes can be prefabricated in thicknesses up to 50 mil (1.25mm). Textured Enviro Liner® 6000x has the same properties whether textured on one side or on both sides so you have to specify whether you need a single sided (EL 61xx) or double sided (EL 62xx) material. Our EL 6160/6260 and EL 6180/6280 materials are normally supplied with a white top textured surface. 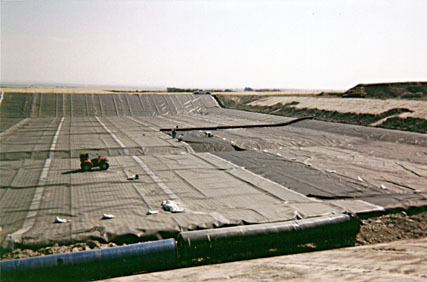 The combination of advanced stabilization, excellent interface friction, and inherent flexibility makes Enviro Liner® textured geomembranes perfect for landfill cap applications.